Not so good. I have been running but not at the caliber I feel I need to be and I feel quite unprepared to start and finish this monster of a race. Let me explain... I did a 24-hour race in Wyoming at the end of May in which I was only able to run 52 miles over 13 hours and then I had to stop because of excruciating hip pain. I tried to stretch it, Lee tried to massage the knot out but it was no use... my entire right hip had seized up and was rendering me useless. Not only could I not run, I couldn't even walk without pain shooting through my hip. I was upset that I wasn't able to run more at that race but it wasn't possible for me to continue. To heal myself, I took a little time off of running and worked on building the strength in my hips (Lee is convinced my injury is from weakness in that area and other muscles compensating in response to that weakness). So the hip pain pretty much dissipated and by July I was feeling confident that I'd be able to do some long runs without any issues. Unfortunately, I was wrong. At the end of July, I did a run from Millcreek Canyon to Brighton and about 8 miles into a 14-mile run my injured hip reared its ugly head and I was crippled with the pain once again. I had to walk the downhill sections of the trail, which are usually where I make up a ton of time because I can cruise down them at a pretty fast clip. By the time I hobbled into Brighton I was completely deflated. How was I supposed to run 100 miles thru the mountains if I couldn't even manage a measly 14? At that point I honestly considered withdrawing from the race. Lee sat me down and gave me a pep talk that made me reconsider dropping out. He said, "Would you be more disappointed with yourself if you did the race, gave it your all and had to quit without finishing? Or would you be more disappointed if you didn't even start the race and quit today?" He was right. I would be so mad at myself if I quit before the race had begun. I realized that even if I start this race and don't finish, it's more important that I give it my 'all' and if my 'all' gets me to the finish.... great! If not... I'll know that I did my best and I will use it as a learning experience for next time. If, on September 11th, I didn't line up at the starting line with the other 270 crazy ultra-marathoning souls I know that I would be beyond disappointed with myself. So... in less than two weeks, at 4 a.m. I will get on a bus in downtown Salt Lake for the drive to a trail head somewhere in Farmington where I will embark on a journey that, whether I finish the race or not, I will remember for the rest of my life. That being said... WHO WANTS TO PACE ME AND HELP ME MAKE IT FROM FARMINGTON TO THE HOMESTEAD?!?! P.S. 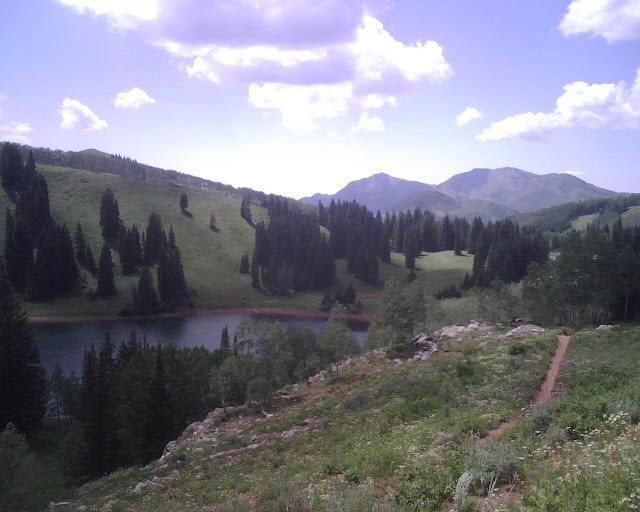 I took this picture on the aforementioned trail run from Millcreek to Brighton. That is the view of Desolation Lake as you climb the ridge towards Scott's Pass. Bre, we are going to try to make it up to Brighton to cheer you on your way. Good luck! Had... that would be AWESOME!!! Thanks a bunch! I'll need all the moral support I can get and it'll be good to see you guys! Tell Janette 'hi' for me! Bre- So I would love to help you, I just need to figure out a couple things for that weekend. Mike has Lotoja that weekend too. I am going to call you so that we can figure out something that will work because I told you from the beginning that I am in! BRI!! Know that I will be thinking of you from the Canyon and if I could be there if I could! And also, even if you only make it like 10 miles I still think it's great to do all the training and make all the effort that you have. And no one will think anything different if you can't make it! I'll be back in SL Mon night and maybe Tues sometime I could give you a massage? Let me know. GOOD LUCK!!! WOW! That is huge! I can't wait to hear how it goes. I'm so impressed and hope you end up happy with the way everything turns out. I'm with Lee and Grace... go give it everything you've got and nomatter what, we'll all be impressed! Good luck and keep us posted! !